So the big question is… what else do you need? I often make parts with holes, or need to make holes in parts. Sometimes you’ll print a part with a hole that needs something inserted into it, either a bolt, or a rod, or a dowel, or screw, or something else round. Running a drill bit through the hole can help smooth things out and get the hole the right size. Sometimes you don’t even need a drill, but just the bit with a pair of pliers, or a vise-grip, or even a vise. Running the bit back and forth (without it turning) can clean up those edges in a hole. On occasion I need to make the holes after I print something. In this case the drill press often comes in very handy. Sometimes you don’t know you need the holes, or you want more precise (or smaller) holes than you can get from printing. There’s no shame in drilling holes in a piece you printed. It’s just another tool in the process of making. There’s also reamers and tappers, but I don’t use those, don’t have those, and won’t get into those. Sometimes part just don’t fit right, or sometimes it’s better to make something a little too large and take of the extra. A set of files (flat and rounded) can do the job. The round ones can also come in handy like the drill bits mentioned above. 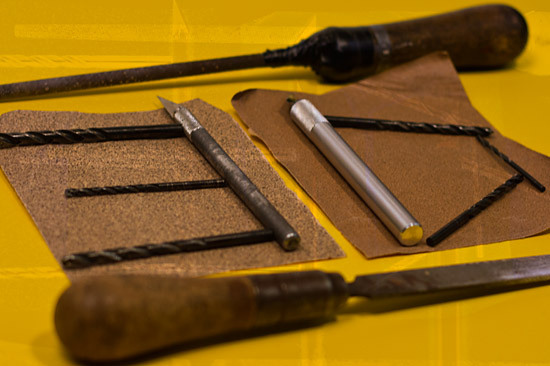 Sandpaper also has its uses, though any of the abrasive tools will leave the surface looking a bit ugly. Ugly is in the eye of the beholder of course, and if it’s a part you don’t see, it probably doesn’t matter. As for the X-ACTO knife (and blades) they can be used to cut away edges, excess plastic, support material, etc. A good knife always comes in useful. I’ve also used a pair of diagonal cutters on occasion. A bit less precise than an X-ACTO knife, but sometimes it’s the right tool. The rubber bands are often used in conjunction with the acetone, to hold parts together until dry. There are of course other uses for rubber bands. As for zip ties, if you built a Prusa, you’ve already got a bunch of them! Sometimes they’re the right tool for holding things together… and sometimes it’s tape. I prefer gaff tape myself, but masking tape can come in pretty handy. I’m sure there’s plenty of other bits and pieces and tools and whatnot that I’ve forgotten (a Dremel tool perhaps?) but I figured this was a good list to get started. Posted on Monday, December 17th, 2012 at 11:50 pm. Subscribe to the comments feed. Both comments and pings are currently closed. Post on your own blog. Add thread-cutters for metric (and optional for the most common imperial e.g. 1/4″-UNC camera) threads. I’ve never used a thread cutter… how are you using them? Ah yes, tweezers! I use a pair of tweezer clamps with handles (they look like scissors) I got from a hospital visit. Nice article! It’s very informative and will definitely help out anyone who is considering purchasing or already have a 3D printer. The idea of 3D printing is very exciting and the possibilities are so vast!